Sweet, spicy, sticky and delicious Crispy Orange Chicken made with fresh ingredients and tastes 100x better than any takeout you’ll ever have! Sweet, tangy, and spicy, this orange chicken is worlds tastier than takeout, and ready in just about 30 minutes. The best part is the crispy chicken—starting it in a cold skillet gets the skin extra crunchy. If you’ve never tried gochujang, add it to your shopping list—this not-too-spicy Korean chile paste adds big flavor stir-fry, marinades, and sauces. If you can’t find it, sub in 2 teaspoons sriracha. Ok, so why order takeout? It’s easy and you’re hungry? The thing is this homemade orange chicken is super easy to make and believe me when I say that it tastes 100x better than any takeout you’ll ever have. You can rest assured that there are no nasty additives and this homemade version isn’t laden with sugar either. Instead, this recipe is made with fresh and delicious ingredients. punchy chili and spices that you’ll love. 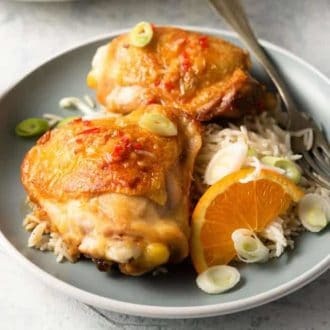 Most orange chicken recipes will use cut up chicken breasts and although that’s still delicious I find that using chicken thighs provides the best flavor. 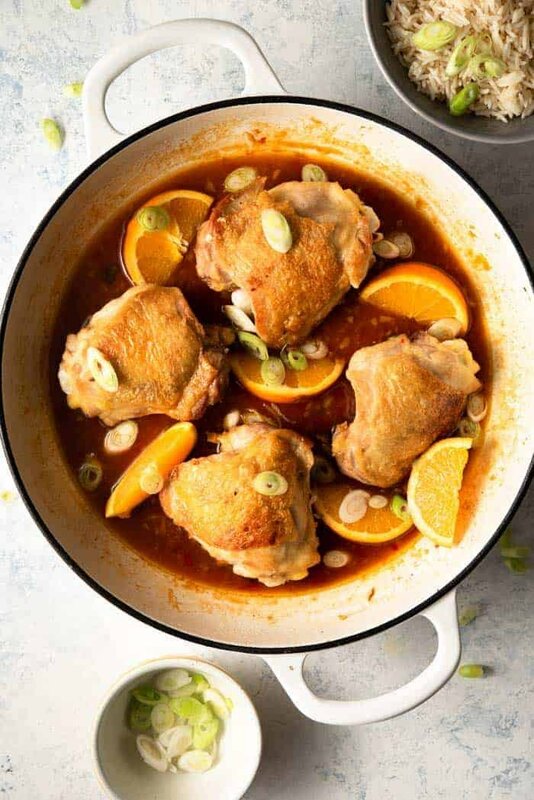 Chicken thighs are much more tender and don’t easily dry out so the meat is always extra juicy and delicious, pair it with this sticky but spicy orange sauce and you’ve got yourself one insanely delicious meal! 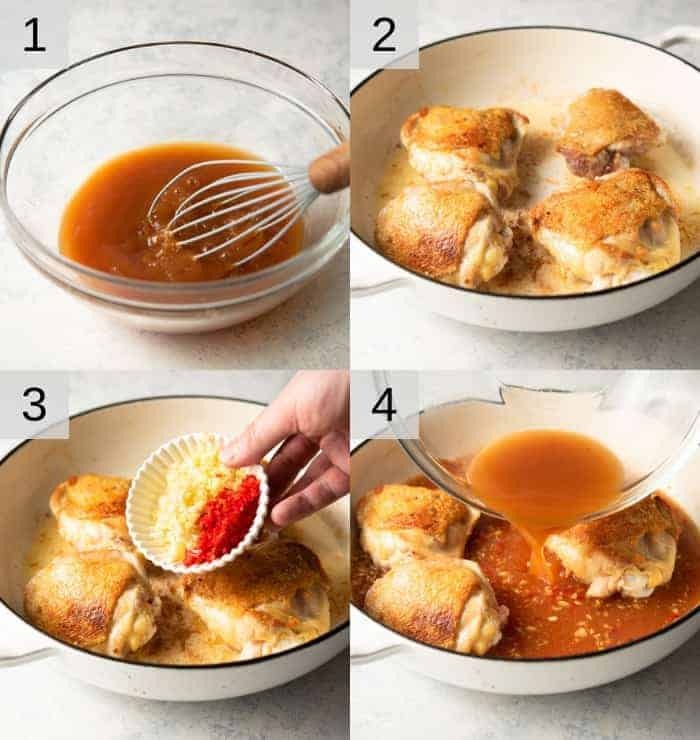 In a small bowl, whisk together orange juice, stock, honey, soy sauce, gochujang, and rice wine vinegar. Set aside. Coat the bottom of 10-inch oven-safe skillet with oil. Sprinkle skin-side of chicken with salt; place in skillet, skin-side down. Cook over medium heat, without turning, until skin is crispy, about 15 minutes. Turn chicken over; add garlic, ginger, and chile to skillet. Cook, stirring occasionally, 2 minutes. Add orange juice mixture to skillet; simmer until chicken is cooked through and sauce has thickened about 15 minutes. Serve over rice, if desired. Garnish with green onion. I love this served with rice and garnished with green onion for a little freshness. 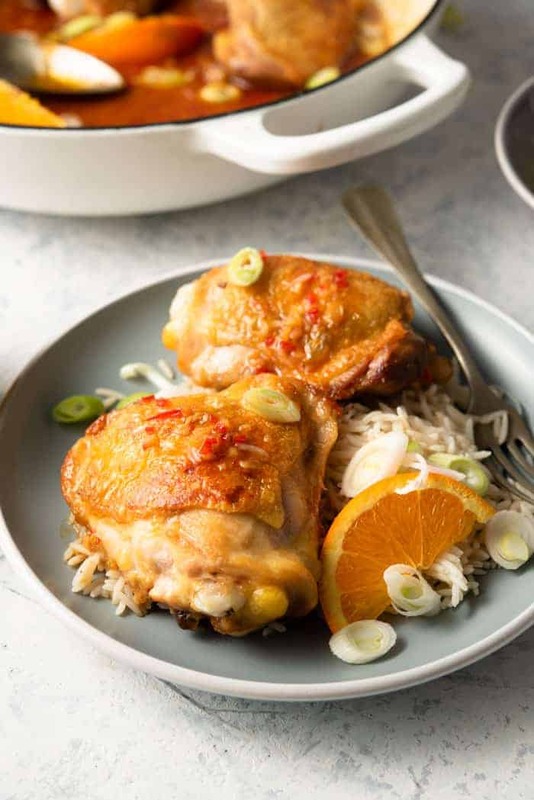 If you don’t want rice you could serve it with Chinese noodles or even mashed potatoes if you’re looking for a comforting and hearty weeknight meal. You can make this recipe lighter and a little healthier by making a few simple swaps. You can use low sodium soy sauce (to reduce sodium) and skinless chicken thighs (to reduce fat). The skin adds a ton of flavor and helps keep the meat juicy but you can opt for skinless thighs or even breasts to reduce fat. To reduce the sugar content you can reduce the honey by half but remember it’s what helps give this sauce a sticky and delicious texture so it may change the end result. Use good quality chicken for best flavor. If you use boneless chicken thighs the cooking time will be reduced slightly. You can check the chicken is cooked by using a meat thermometer, it should read 165F. If you can’t find gochujang you can replace it with 2 tsp of sriracha. If you’d like a spicier sauce you can add more fresh chili to taste. This recipe can easily be doubled to serve more people. Serve with orange wedges and green onions as garnish. Vegetable stock can be used instead of chicken but it will change the flavor slightly. To reduce the sodium you can opt for low sodium soy sauce. Leftovers can be stored in the fridge for around 2 days or frozen in suitable containers. 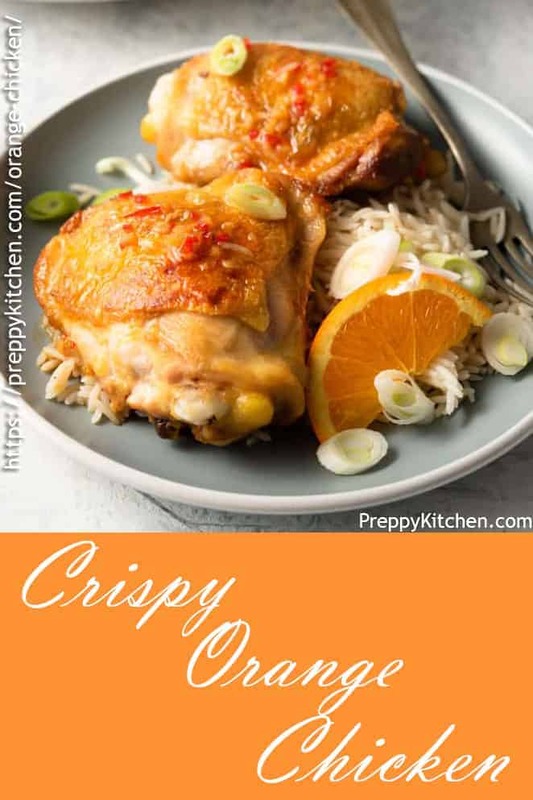 If you’ve tried this crispy orange chicken recipe then don’t forget to rate the recipe and let me know how you got on in the comments below, I love hearing from you! Sweet, spicy, sticky and delicious orange chicken made with fresh ingredients and 100x better than any takeout you'll ever have! Add orange juice mixture to skillet; simmer until chicken is cooked through and sauce has thickened, about 15 minutes. If you can't find gochujang you can replace it with 2 tsp of sriracha. If you'd like a spicier sauce you can add more fresh chili to taste. Made this dish the other day. Great flavor but was disappointed because my sauce never thicken up. We served it over rice and then dribbled the juice over it. Since I doubled the recipe the sauce almost covered the chicken and so the crisp part of the chicken got soggy. My family loved the dish though.